A Quick Detour to Rib Cage Island. After a too-long prologue set in 1944 teases the gigantic ape, we leap ahead to 1973. Bill Randa (John Goodman), an operative for the mysterious Monarch organization, convinces a senator to sanction an expedition to a newly discovered island. His escorts will be a military unit finishing their tour in Vietnam, led by Colonel Packard (Samuel L. Jackson). Because Randa and his associate (Corey Hawkins) have ulterior motives of the monster-hunting kind, they recruit tracker and mercenary Conrad (Tom Hiddleston). Also joining the team are anti-war photojournalist Mason (Brie Larson) and several soldiers and scientists that deepen the potential victim pool. 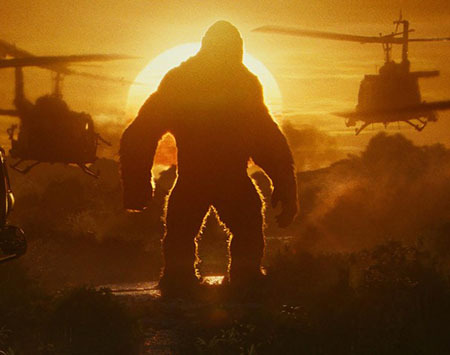 As the helicopters fly over Skull Island and drop “mapping” bombs, an angry ape the size of a high-rise appears in front of the setting sun. Instead of taking evasive action, the fleet engages the beast. During Kong’s initial attack the copters carrying major characters are disabled and crash, while the ones filled with bit players immediately explode on contact. Those who are left begin a trek through the merciless jungle. Some get further than others. Even though the curiously large battalion is whittled down quickly, the cast remains way too large to become interested in anyone. Especially as director Jordan Vogt-Roberts jumps between two different crews of survivors. There’s a hint of depth to Jackson’s Colonel, an aimless career soldier suddenly without a sanctioned war, who’s given a monstrous new adversary. For those in disagreement with him, conflict boils down to a couple of tensionless Mexican standoffs. As a halfhearted romance blossoms between Hiddleston and Larson they share bits of backstory, but mostly they just pose and stare in awe. 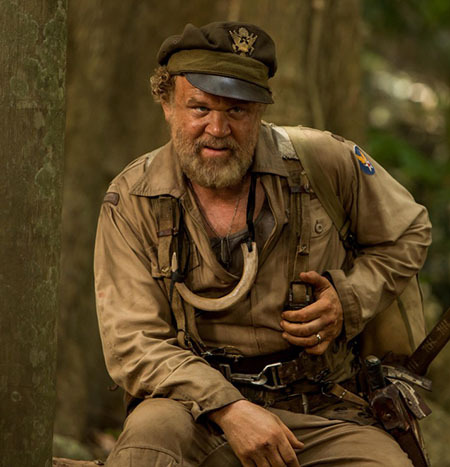 The one human highlight is John C. Reilly as a loopy pilot who’s been stranded on the island since World War II. Most of the comic relief from Reilly works much better than other attempts at levity. Are we supposed to laugh at the Richard Nixon bobblehead on a helicopter control panel as the craft crashes and several soldiers die violent deaths? The collection of dog tags and somber burials would suggest not. 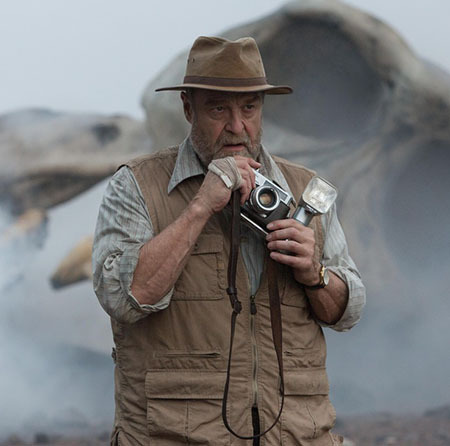 Reilly is also helpful as an entertaining provider of information, warning everyone about the dangerous creatures that threaten the ecosystem (and the world at large), and the balance that Kong provides. Again, there’s no true interest in man’s eternal struggle with nature and coming to grips with their place in it. Notions and platitudes are used as rickety bridges between scenes of pterodactyl-like birds swooping in for dinner or giant bipedal lizards emerging from the ground to hunt. Vogt-Roberts stages the skirmishes well, especially in a final battle where Kong and his adversary have a very detailed and visceral melee that manages to avoid feeling like two computer creations duking it out. Kong himself looks fantastic. Two close-ups of his eyes, one set against a fiery explosion and another in a moment of contemplation, communicate the beast’s ferocity and soulfulness. The island is similarly beautiful and unforgiving and there’s a sense that danger and/or wonder is always lurking. However, the pattern of setup/monster set piece eventually grows as tiresome and transparent as the classic rock soundtrack. 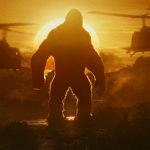 Kong: Skull Island delivers lavish creature feature satisfaction, it just gets caught in a weird place between escapism and weightiness without quite achieving either.